Too comfortable in bed to reach for the light switch? With a mere utter of “Okay Google”, you can not only dim the lights, but also play music in the background and operate other smart devices without so much as lifting your head off the pillow. That is if you have Google Home as your new family member on standby. A year and a half later after its official launch in the United States, Google’s voice-activated speaker will soon be available in Singapore. 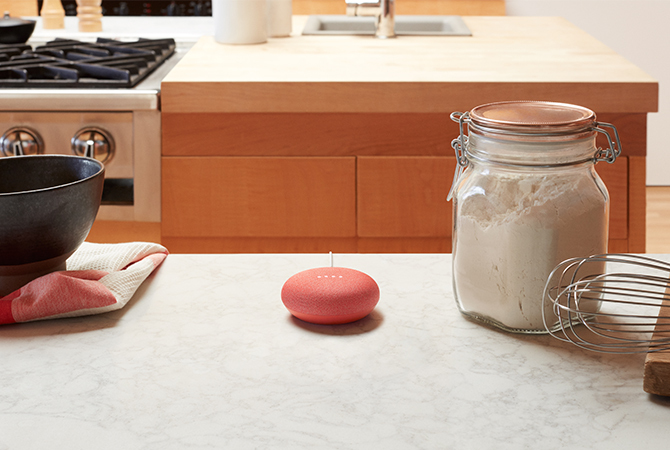 Available in fun colours of Chalk, Charcoal and Coral, The Home device will cost $189, while the Home Mini retails $79. Both smart devices are available for purchase at StarHub, Courts and Challenger retail stores from 20 April onwards. Why the long wait though? The delay of the Home’s launch in Singapore is due to Google’s effort of localising the device in Singapore. This way, Singaporean consumers can enjoy a tailored experience in their homeland. A notable indication is that the inbuilt Google Assistant can understand and converse in Singlish. Furthermore, it seamlessly connects users to local entertainment channels such as news outlets, radio stations, youtube videos and the latest Netflix shows with Chromecast on the television. Hankering for a local delight? As it understands our colloquial food terms such as popiah and char kway teow, the Home device can suss out dining recommendations according to local food cravings, without being limited to common words like sushi, burger or pasta. The Google Home devices are also meant to be shared at home, thanks to its superior technology that can recognise different voices from up to six people. With Voice Match, the Google Assistant can cater to the lifestyles of these six individuals, such as playing their personal playlist or pulling out their schedules. That’s not all, Google has also worked in tandem with local establishments such as National Library Board, OCBC Bank, and Singapore Airlines to with its Actions option. This way, consumers can tap into these brands by just saying “Hey Google, talk to…” to quickly access to their services when needed. There’s no need to rely on third-party outlets for Google merch anymore as consumers can now gain direct access to the online Google Store. Aside from the Home devices, you can purchase other product such as Google’s Pixel 2 XL smartphone, the wireless Pixel Buds, Google Wifi and Google Chromecast and have them delivered to you directly. For purchasing Google products and to preorder the Home devices, head to the Google store.